Tallahassee Mayor Andrew Gillum hopes to be Florida’s next governor. 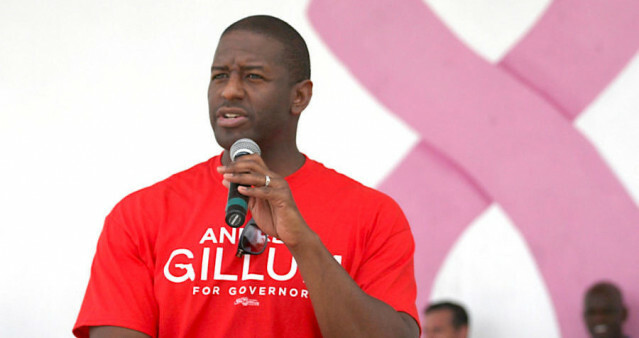 Florida’s Andrew Gillum wants to expand Medicaid, which would vastly improve the state’s fight against HIV. In a year when the battle for who will take control of the House and Senate has been at the forefront of the American political consciousness, it was a gubernatorial primary in Florida that stole the headlines on Tuesday night as Tallahassee Mayor Andrew Gillum won a surprise victory, poising him to potentially become the first black governor in the state’s history. Gillum, a progressive who notably received endorsements from Senator Bernie Sanders (I-VT) and former Secretary of Housing and Urban Development Julian Castro, defeated the heavily favored former U.S. Representative Gwen Graham (D-FL-2) in a win that has energized progressives across the state and the rest of the country. People living with and affected by HIV will notice that Gillum’s campaign platform includes his support for a national Medicare For All healthcare system and his endorsement of Medicaid expansion for the state of Florida, which is 1 of only 17 states not to expand the program thanks to the efforts of current Florida Governor and Republican U.S. Senate hopeful Rick Scott, who has earned the support of President Trump in large measure because of his continued opposition to Medicaid expansion and the Affordable Care Act in general. While Gillum wouldn’t have much say over the direction of federal health care policy, the potential for his election to usher in Medicaid expansion is huge for the nearly 136,000 Floridians estimated to be living with HIV and the hundreds of thousands of others in state who are currently at risk of contracting the virus. Roughly 4 in 10 Floridians living with HIV are currently not in care. Expanding Medicaid, which covers more than 40% of people living with HIV who are in care, would go a long way in addressing a worsening HIV epidemic in the state. In contrast to Gillum, the newly minted Republican nominee for governor in Florida, Ron DeSantis, celebrated his win by going on television and sounding off a poorly disguised racist dog whistle the day after the election. On Fox News earlier this week, DeSantis told Florida voters that “the last thing we need to do is to monkey this up” by electing someone like Gillum. This remark, which engendered a great deal of attention and condemnation from the media, progressives, and leaders in the black church in the state, promises to be a harbinger of what’s to come in the rest of this highly competitive race. Meanwhile, in Arizona, the state took a brief respite from mourning the loss of Senator John McCain the previous weekend to vote for their nominees for Congress and statewide office. On the Democratic side, Rep. Kyrsten Sinema (D-AZ-9) won her party’s nomination unopposed, while Rep. Martha McSally (R-AZ-2) won the Republican nomination, beating out right wing populist firebrand Kelli Ward and Sherriff Joe Arpaio, who ran for Arizona’s Senate seat shortly after being pardoned by President Trump for criminal contempt of court for his systemic racial profiling of Latinx individuals in the state. Sinema and McSally are vying for retiring Senator Jeff Flake’s Senate seat, while the seat formerly held by Senator McCain will remain vacant until a special appointment is made by Governor Doug Ducey, who won a surprisingly contested GOP gubernatorial primary himself on Tuesday night. McSally, who was not shy about stating her displeasure with Trump during the 2016 election—in a Tweet, she called his remarks on sexual assault in the infamous Access Hollywood recording “disgusting” and “unacceptable”—has done a full 180 on her public attitude towards the President, embracing some of his most hardline positions on issues like the border wall, reversing her previous support for the so-called “Dreamers” who had come to the United States as young children with their undocumented parents, and even calling the press “fake news.” Like the vast majority of Republican Congressional candidates, McSally’s road to her party’s nomination ran through President Trump, and the general election on November 6th will be as much a referendum on him as it will be on the merits of her own campaign. AIDS United wants to ensure that the HIV community is engaged with, informed on, and registered for the 2018 midterm elections. We encourage you to utilize our Elections Resource Center and continue checking the Policy Update for the latest HIV-related election news.